My Porcelain Homewares Collection is all about sharing precious moments with friends and family, or enjoying a quiet moment by yourself, while indulging in beautifully tactile wares. There is something so special about dining and drinking from items made by hand. This collection is inspired by patterns and colours which occur in nature; landlines and tidelines, colours and patterns that evoke quiet memories, such as walking on the beach and watching a colour streaked sunset. These wares are versatile, unique and multi-functional. They are made on the potter’s wheel from porcelain clay which has been layered with colour. They have a soft quality which feel delightful in your hands, are glazed inside. The mugs and creamers also have glazed circle finger indents which make it easy to pick up and poor, as well as adds an extra feature to this collection. Porcelain dining set created on the potters wheel with marbled clay. Rediscover Ceramics and enjoy tapas, nibbles, breakfast or coffee from a handcrafted vessel. Handmade Ceramic Mug, Modern drinkwear. Created by hand in Western Australia, inspired by land and sea lines. Unique Handmade Marbled Bowl and Creamer featuring red swirling clay throughout. Spice up your life with a hand crafted porcelain collection of mini spice bowls. These wares are versatile, unique and multi-functional. They are made on the potter’s wheel from porcelain clay which has been layered with colour. They have a soft quality which feel delightful in your hands, are glazed inside, and each piece also has a glazed circle which adds an extra feature and signature trait to this collection.They are robust enough for everyday use, can be used with hot or cold foods or beverages, are dishwasher, and microwave safe. 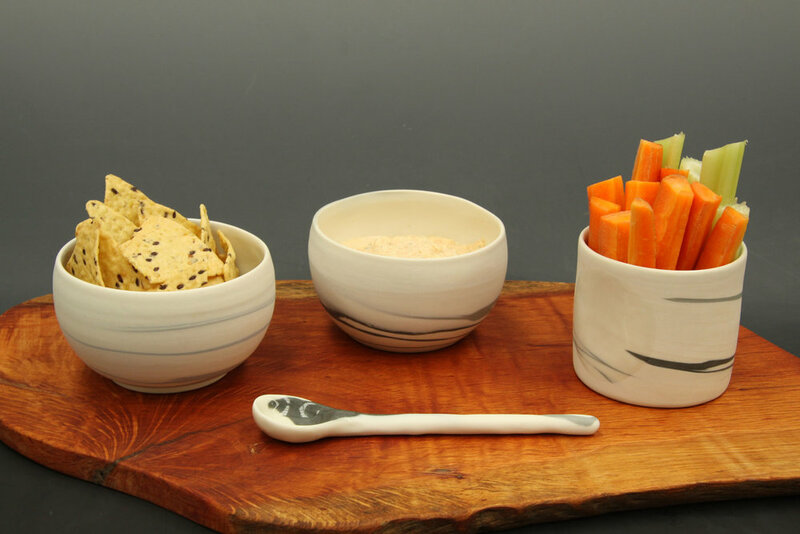 This lovely range can also be purchased as a set with my natural edged serving boards, handmade with up-cycled local timber. I love uniting the contrasting and complementing qualities of wood and clay in my work, and as my father has been a wood craftsman for over 20 years, I am extremely fortunate to have his tools, workshop and expertise at my fingertips. This collection is inspired by patterns and colours which occur in nature; the layers of time which are reflected in our natural environment. My use of softened, swirling colours evoke quiet memories, such as walking on the beach and watching a colour streaked sunset, or observing natures rings of time in a piece of wood or spiraling shell.